RANGER Mix is an easy-to-use, high-performance enzyme blend, specifically developed to amplify fragments up to 25 kb in length. RANGER contains a unique combination of a highly-efficient DNA polymerases and novel buffer system that deliver the improved efficiency necessary for reliable amplification of longer amplicons. 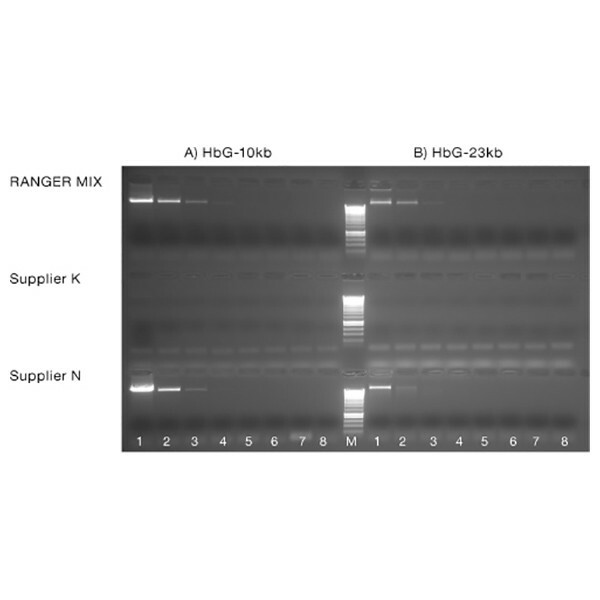 RANGER Mix is an all-in-one mastermix containing dNTPs, MgCl2 and enhancers at optimal concentrations, minimizing the requirement for PCR optimization and driving greater sensitivity. RANGER Mix also improves reproducibility and minimizes the requirement for assay repeats, by reducing the number of pipetting steps, and therefore the risk of manual error, during reaction set-up. ""I was really impressed with how well the RANGER Mix worked on my long ...	"
""RANGER Mix works well on long PCR products. The fragments I was trying ...	"
"RANGER Mix works well on long PCR products. The fragments I was trying to amplify were both ~10kb and the yield was good for both of them." "I was really impressed with how well the RANGER Mix worked on my long range application for screening ES cell colonies and I will be switching over to this immediately."